Want to know celebrities' beauty secrets? As you get older you need that extra boost. The stars don't just get facials on a regular basis - they also add technology to their skincare repertoire. Like Madonna... she gets microcurrent facials (she even made a video about them) using the same machine I use at Dalini Skin Care Spa. Take your anti-aging facials to the next level with microcurrent technology! The ultimate in facial revitalization without surgery. This non-invasive Microcurrent Ultimate Age Defying Facial series is a complete and comprehensive service that reduces fine lines and wrinkles, improves skin tone and elasticity, and offers intense hydration. Maintenance services are recommended monthly for longevity of results. During a microcurrent treatment, mild electrical pulses are delivered to stimulate the skin and tone the facial muscles. The current boosts collagen production to tighten the skin and increase circulation to give the skin an overall look and feel of radiant rejuvenation. After regular microcurrent sessions, Glenna looks years younger. Looseness and wrinkles have been transformed into smooth, youthful skin. Areas that were sinking with age have regained their firmness and glow. "Invest in your skin. 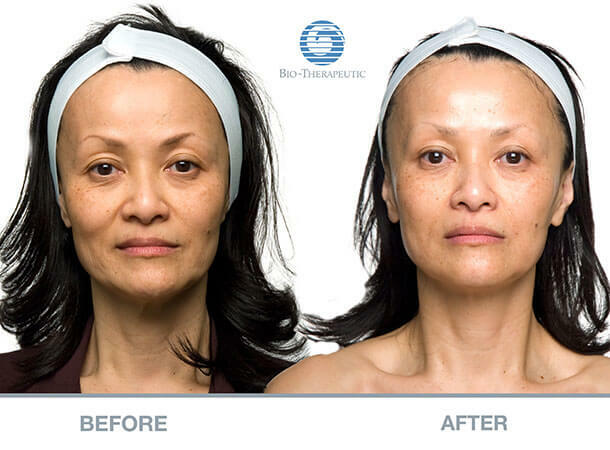 It’s going to represent you for a very long time"
Microcurrent facelift treatments trigger the body's production of amino acids and Adenosine Triphosphate (ATP). ATP is the biochemical way our cells store and use energy. It's what keeps your muscles and every cell in your body alive and functioning. Increasing ATP increases normal cell activity that can diminish with age. This includes the cell's ability to repair itself and perform its designated functions. Are You Ready to Achieve Youthful and Flawless Beauty? Microcurrent is a very safe treatment that has been used successfully in the beauty and medical fields for decades. However, there are certain medical and health situations in which microcurrent is not recommended.